← How to print MS Office Excel to pcx using Document Converter? How to print MS Office Excel to png using Document Converter? About this topic,this article will show you how to convert MS Office excel to png format file with a powerful converting software,also a virtual printer—docPrint Pro.Before knowing how it works,you should know what it is and what advantages it hold. What are the advantages of docPrint Pro? (1)Create PDF, PS, EPS and image files from any Windows application that supports printing. (2)Convert Microsoft Word, HTML, Web Pages, RTF, Text, Excel, PowerPoint, Visio, AutoCAD drawings, Adobe PDF, PS, EPS, e-mail etc. files to PDF, Postscript (PS), EPS, EMF, WMF, JPEG, TIFF, BMP, PCX, PNG, GIF, TGA, PSD, PCD, MNG, PIC, PBM, PNM, PPM, AVS, JBG, JP2, JPC, WBMP, XBM, XPM, XPS, PCL etc. files;(3)Save web pages in PDF format for future references;(4)Font embedding, resolution and image compression support;(5)Support Windows XP, Windows 2000, Windows 2003, Vista, Windows 7 and so on.If you want to learn more features about docPrint Pro,please click the following link:http://www.verypdf.com/artprint/index.html. There are more detailed introduction about docPrint Pro. 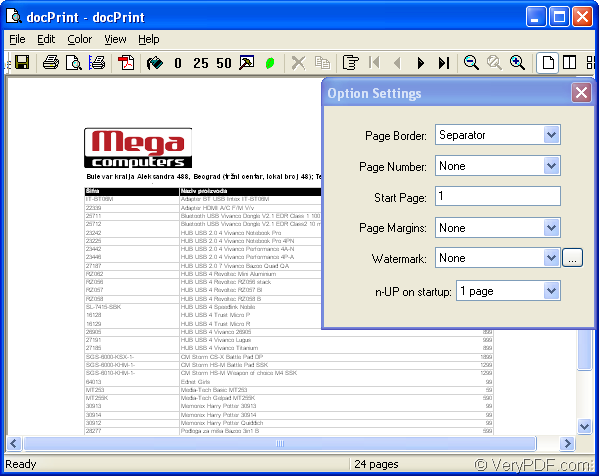 You can download docPrint Pro at http://www.verypdf.com/artprint/docprint_pro_setup.exe and install it in your computer.In the end of the installation,the dialog box will ask you whether to set docPrint Pro as your default printer.Of course , “Yes” is recommended because this can save you a lot of time if you are very busy everyday. How to convert excel to png with docPrint Pro? (1)Run your printer driver by the following ways. Double click the excel document or right click the file and click “Open” option in dropdown list to open the excel file.Then click “File” –“Print” to pop up “Print” dialog box in which you should set current printer as “docPrint” in “Name” combo box,then click “OK” button. After opening excel document,you can press “Ctrl”+ “P” on your keyboard to open “Print” dialog box. 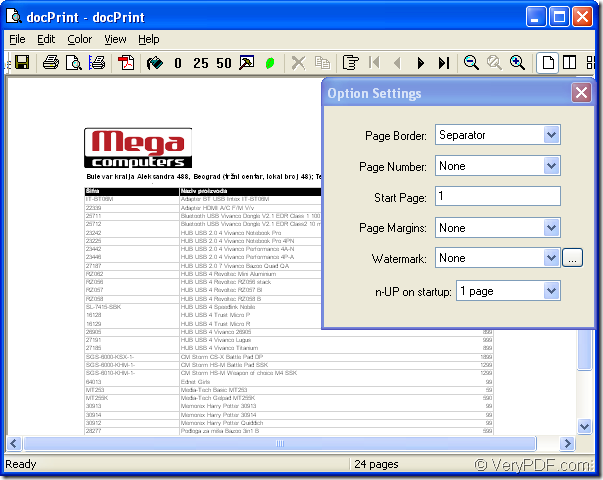 If docPrint Pro is default printer in your computer,you can click the icon in the toolbar to run docPrint Pro directly. Right click excel file and click “Print” in dropdown list instead of opening the document if you have set docPrint Pro as your default printer. (2)Open “Save As” dialog box. After running the printer driver,you will see “docPrint” dialog box showed in Figure1,in which you can open “Save As” dialog box according to the following methods. Click “File” and click “Save as” in dropdown list.This is the regular way. Click the icon in the toolbar,which means “save file”. Use the hot key “Ctrl”+ “S” combination on your keyboard,which is a quick way. Specify the location for the target file in “Save in” combo box.You can choose the existed location or a new created one. Edit the name for the output file in “File name” edit box.For example, “Hi!”, “Hello!”. Choose the file type for the output file in “Save as type” combo box.If you want to convert excel to png format file,the output format should be “PNG File(*.PNG)”. Save the output file by clicking “Save” button. In a short while,you will get your target file—the png format file.You can browse it with some kind of programs such as Photoshop,IrfanView,GSview or others.If you want to read more articles about docPrint Pro,please visit http://www.verypdf.com/wordpress/. If you have any questions,welcome to leave messages. How can I convert multiple Excel files to PNG images quickly? This entry was posted in docPrint Pro and tagged excel to png. Bookmark the permalink.